Miller Personal Self-Retracting Lifelines And Fall Limiters Provide Fall Protection For Applications Including Construction, Industrial, Maintenance, And More. Miller personal self-retracting lifelines and fall limiters are made of high quality materials for long lasting durability and corrosion resistance. Lifelines and limiters minimize fall clearance, enhance mobility, and prevent tripping hazards. Units provide a compact, lightweight, and cost effective alternative to shock-absorbing lanyards. Devices attach directly to harness D-ring for improved operator mobility and application versatility. Built-in swivel prevents lifeline coiling. Available styles include Black Rhino Self-Retracting Lifelines, Falcon Self-Retracting Lifelines, MightyLite Self-Retracting Lifelines, Miller Scorpion Personal Fall Limiters/ANSI Z359, TurboLite Personal Fall Limiters, and TurboLife Personal Fall Limiters/ANSI Z359. Weight capacities are 310 and 400 lbs. Colors are Black, Black/Red, and Silver. OSHA, ANSI, and CSA approved. Dimensions vary per model. Rigid Lifelines® Self-Retracting Lifelines Provide Fall Protection In Maintenance, Construction, Utility Personnel And More. 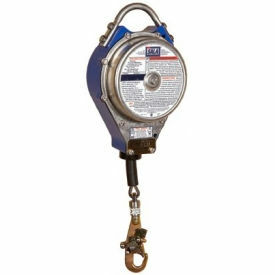 Defy™ Self-retracting lanyards (SRL) can be connected to either a rolling trolley or a single anchorage point to provide fall arrest after an unintentional loss of balance. 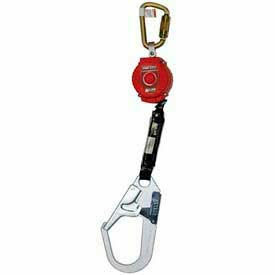 ANSI rated steel swivel snap hook on lifeline end, ANSI rated carabiner on top of unit. Zinc plated snap hooks provide added security with fall indicator on cable end. The units with polyester webbing lifelines are strong and lightweight. Lines feed out slowly but lock when jerked, like a seat belt, to ensure safe and reliable usage. Lifelines are rated to 310 lbs. Lengths range from 6' up to 50'.